Lucy's Cards: Merry, Merry, Merry! Here are a couple of digi cards I made using Hero Arts new digikits. 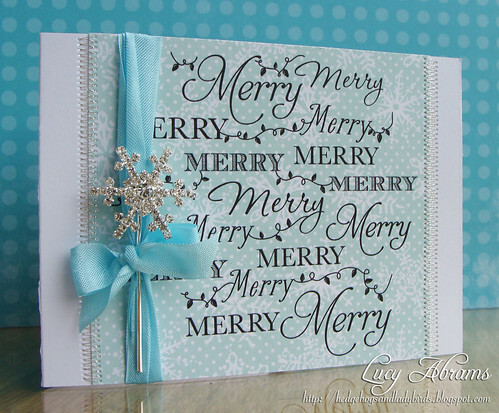 First up, a card made with the Merry Background kit. First, I created a background by layering some snowflakes from THIS kit over polka dot paper from THIS kit. I then added the Merry stamp on top. Some seam binding and THIS fabulous stick pin finished it off, along with some silver stitching. And next, a card made with the Merry Lights kit. 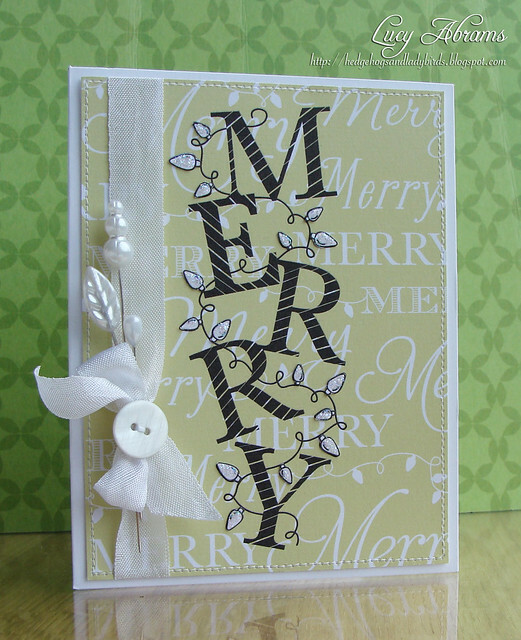 For this one, I layered the Merry Lights stamp over the Merry Background stamp (it comes in both solid form like this, and black outline as in the card above). I printed the lights again on white, cut out the bulbs, added glitter and paper pieced. Some white seam binding and pins tied the card together. Wow, they are both stunning cards Lucy! Hope you'll have a wonderful weekend, too! Lucy, these are both sooo beautiful! LOVE them both! Both cards are fantastic! Great idea! Thanks for the inspiration, Lucy. Oh Lucy these are fab love the layered prints! WOW, these couldn't be any more beautiful Lucy! I can't believe they are digi kits! LOVE the colors! Oh what fun! Your cards are always to fun & cheerful. Thank you. Both cards are fabulous Lucy. Simply wonderful! I need to go play with some digi kits!